This post has nothing to do (much) with wildlife management. But, I couldn't pass up this photo that a friend, Gwenn, sent us from Rwanda. 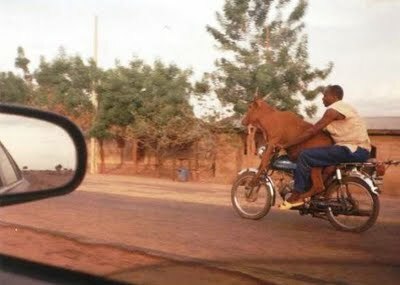 Her friend took it, and Gwenn commented that it was not the strangest thing they had seen transported on a motorcycle in Rwanda. Goes to show that a person has to think creatively about how to use resources. (See...I'm trying to bring this back to natural resource management.) Sometimes we don't realize the potential that exists in something we see/use everyday! Elephant: a truly invasive species? Readers may know Salem, Massachusetts as the birthplace of Nathaniel Hawthorne or the Salem Witch Trials of 1692. But, you may not know that Salem was one of the first ports that received the first elephant to step foot on American soil! Americans, of course, were intrigued by this odd creature that was returning to the home of its ice-age ancestors (the State Museum in Nebraska has a great collection of these prehistoric pachyderms). Our infatuation with the unusual has led to the import of many wildlife species, and most of these stories end badly--new predators that suppress native prey species or filter-feeding aquatic species that knock ecosystems out of whack. Elephants don't match the definition of an invasive species (high reproductive potential, mainly), so--200 years later--we're not overrun by elephants in North America. However, some biologists have suggested that elephants (and lions and other critters) should be reintroduced to the Great Plains through a process called 're-wilding'. That's interesting to think about. Obviously, the suggestion is more than a little controversial, especially given our success with exotic introductions during the 20th century. Maybe the US should have elephants roaming the plains? During a recent trip to Namibia, our students were amused when the native Namibians were astounded to hear that we did not have lions and elephants in the US. You could just see their amazement that elephants were not a universal creature. Our family recently visited Salem, where I read about the story of the 18th-century day when the elephant walked down a very long wharf towards the amazed townspeople. As I think about the Re-wilding of North America, despite my conclusion, I'll have a new image in my mind--that of an elephant making the slow walk down the gangplank and wharf, towards Salem. Our family recently visited the home of Louisa May Alcott, in Concord, Massachusetts. Although the story of the writing of "Little Women" is inspirational, the sub-text to the popular female author's home is the story of her father, Bronson Alcott. He was a member of the group of philosophers who formed the roots of the transcendental movement. Bronson also encouraged his daughters to become educated, and was ahead of his time with regard to pedagogical methods. He was criticized and ridiculed for his methods, and his schools failed over and over to make any money. He was just born 200 years too early. I think that Bronson would be a problem-based learning teacher, if he were alive today. The heart of his pedagogy was to have learners actively exploring their subjects. He definitely was not an advocate of the "sage on the stage"! I was especially drawn to a list of 58 "maxims" for teaching that was sold at the shop. Of course, I didn't purchase one because I was certain it would be available on the internet. I wasn't disappointed. I've copied and pasted some of my favorites below. Thanks to the American Transcendentalism Web for posting the entire lot here. There are a lot of things to consider in the list below. I've been pushing for the last few years for a new approach to educating our wildlife biologists. 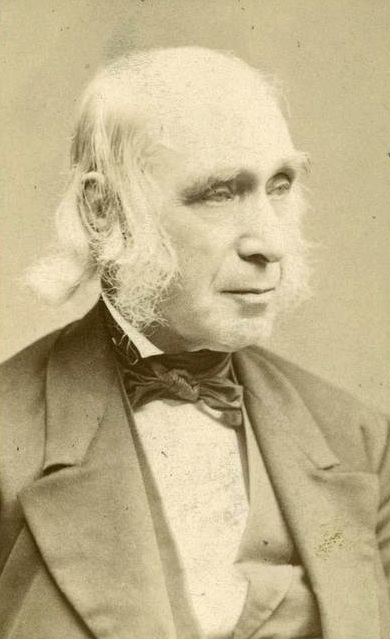 Bronson Alcott would shudder if he were to look at a Wildlife Ecology and Management textbook. But, that is a story for another day. I was especially interested in the maxim that states to teach nothing that students can teach themselves. I just completed a semester in which I employed a Team-Based Learning approach, which forces students to study basic material before I start to lead them (through activities or lectures) the higher-level concepts. Some students like this. Others don't. Sometimes my colleagues (who use the same approach) and I receive comments that students are paying for us to teach them. Why should they have to read the book? They are paying us to do the heavy lifting. Right?! Well, all I can say is that Bronson Alcott would have a response to those students. And now, so do I. "Please see Maxim #34 on the attached list." ----Thanks to the New York Public Library collection for the image above. I think it is always good to approach science, and life in general, with the attitude that there are things we know, things we think we know, and things we don't know. This certainly applies to one of my areas of research: the ecology of birds while they are nesting. I've been studying this general field since 1993. 'Things we know' about nesting birds would include the fact that most species have nest success rates (at least one chick leaving the nest) in the range of 5-35%. Probably a lot lower than the general public realizes, but as they say---nature is red in tooth and claw. Predators have to eat, too. 'Things we think we know' might include general guesses at what is causing nest predation events. We can look at the remains of nests and egg shells, and makes some educated guesses. Perhaps an empty nest means that a snake came by and ate all the eggs or chicks. A nest filled with munched-on egg shells might mean a mammal of some kind. Stuff like that...we think we know. 'Things we don't know' includes the daily behaviors and adventures of females that are sitting on the nest. How often do they leave the nest unguarded? Are they successful at chasing off predators on a fairly regular basis? What times of day do they leave the nest? Do females with successful nests have different behaviors than females with unsuccessful nests? We really have no clue. Or, at least we didn't until we started putting video cameras on nests. In the past 10-15 years, tiny video cameras and associated recording devices have given us an insight into these behaviors. And, you always learn some thing new. My prairie-chicken research crew is monitoring hens and nests this summer with video cameras. Josiah Dallman is an undergraduate research associate, and his summer project is to learn about nesting behavior through video. There are some keen insights that we can gather from the first look-through of the video, with the take-home message that there is a lot more activity around a prairie-chicken nest than we originally thought. The hen leaves during the cool morning and late afternoon for 15-45 minutes. Deer come by and investigate. Hail storms shower the nest with golf balls. Life on the prairie. I'll paste two 'predator' videos here for you. The first is a visit to a nest by a badger. You'll see an initial 'pounce' and the hen flushes. The badger checks out the camera at one point. The badger eventually spends most of the footage hidden, at the left of the screen...you'll see grass moving while it eats the eggs from the nest. The video is shot with infrared light, at night. The second is the 'battle of the ages' video. This hen has already lived through the hail storm. During the 3-4 days before this video was taken, a snake visited the nest more than once (during the day), and she successfully chased it away. Then, on the fateful night, the bull snake (we'll pretend we know it is the same snake, but it makes sense) comes back and will not be deterred. Neither will the hen give up her nest. It is a battle to the death. In fact, the field crew later found the hen dead about 5 meters from the nest. The bull snake and hen leave the video area and continue their battle, so we don't know exactly how the hen died. But, our best guess is that she was so stressed by the events on the video that she expired--we have to be very careful when we handle the birds for tagging (they are all radio-tagged so we can find their nests). If stress can kill them during banding and tagging, surely stress can kill them during natural events as well? You can draw your own conclusions...feel free to comment! So, it is the battle of the ages. I've never seen a video like this...with such a back-and-forth between a hen and predator. Most of the time, the hen gives up and lives to lay another nest. In fact, this battle goes on across the prairies (and forests, and wetlands) every summer, and has been going on for ages. The choice of nest site. Predator versus prey. The protective nature of a parent. The decision of when to give up and start over. This is the sacred dance of population dynamics. Enjoy the clips. A quick toss to my Picasa album of 140 (or so) photos from our UNL Namibia study tour. The group is below: 8 students, plus Dr. Pegg (at right). We're pictured with Peter and Doris Becker (towards the left), a farm couple from Namibia. Peter traveled to Nebraska as part of his training in South Africa; our family met him and Doris during 2009. Our group stayed with them, on their farm, on the last night of our trip.